This July, IDW Publishing and 44FLOOD come together again to release an all-new four-issue series, The Squidder, from famed comic artist Ben Templesmith. Templesmith returns to IDW as a triple threat with a series in which he writes and provides story, art, and lettering, as well as the primary covers. The Squidder mixes action, horror, science fiction, and fantasy elements with a touch of “Squidly” destruction. Templesmith first gained renown as the artist responsible for the singular style of 30 Days of Night, which he co-created with noted horror-master, Steve Niles, and that went on to well documented success as a major motion picture. Templesmith has previously written and drawn the series Singularity 7 and multiple Wormwood: Gentleman Corpse miniseries. The Squidder, which was the focus of a wildly successful Kickstarter campaign for a limited graphic-novel edition of the story, centers on an old soldier, one of the last of the legendary Squidder Legions, from a forgotten war. The post-apocalyptic world seems to have left him behind, but it remains to be seen if a discarded relic with a death wish and a rebellious Squid priestess can overthrow humanity’s tentacled alien overlords. 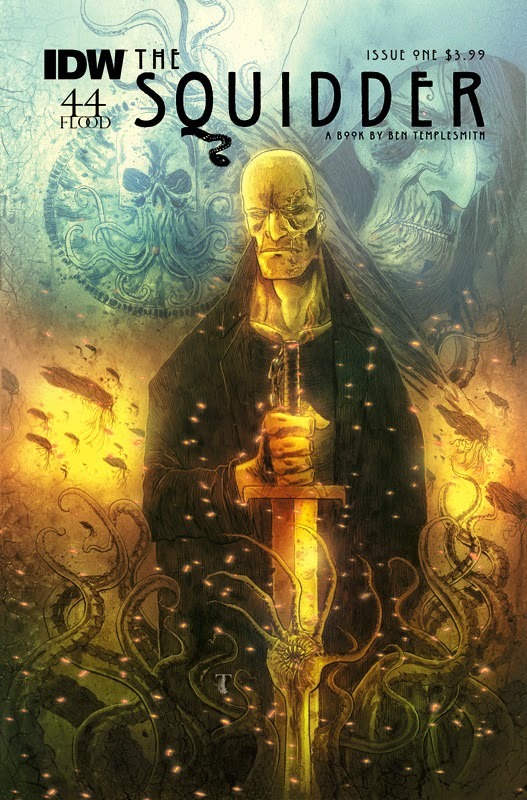 Templesmith has returned to his roots to do the tentacle/Cthulhu-orientated book he's always promised, and IDW is proud to release another stunning and original project with an artist so important to the foundations of the company.